The team appreciated a restful night’s sleep, a great shower, and a delicious breakfast before we headed back to Bethlehem for a day full of activities. We were greeted by Rosita and first on our agenda was to meet with her about her ministry. Rosita described how she thought God’s plan was for her to be in San Lucas at Rosa de Amor and while she still prays that may work out, God has made his plan for her work at “Bethlehem” in Coban very clear. 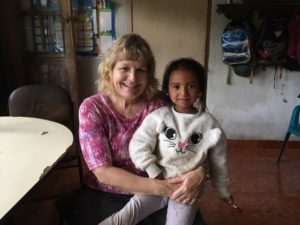 Originally her “vacation home” God has abundantly blessed the community around Rosita’s home with the school, children’s program and meal programs that she has started. We laughed about telling God our plans- a vacation home- God said, “ No way, I have big plans for your ministry at Coban my servant Rosita!” She brought some of the younger children from Rosa de Amor in San Lucas to Coban over their Easter break and she found the children thrived at Bethlehem and have been living here since then. Hundreds of the local people, many of whom are of Mayan descent and speak a dialect very different from Spanish, come to Bethlehem with their children to hear about God and hear God’s word as part of the ministry Rosita provides. Rosita explained there is much idol worship among the local people so hearing God’s word is a light in the darkness. There are several church services at Bethlehem each Sunday and Bible class twice a week for the community. There is a school for elementary children with 20 children currently which includes the children now living at Bethlehem with Rosita. Among the hundreds who come for physical and spiritual food are mothers dressed in traditional dresses many carrying infants, older children and some men. Today after they had all been given a hot meal, they gathered to watch the children perform to several songs and to listen to our VBS songs and then the message given by Pastor with Cindy’s help. Talk about feeding the masses! We saw many smiles from many parents and had many hugs from the children today. I started wondering how to get another lap and extra arms to hold them all! We also were blessed today to help teach some English words to the students who are in school here and let them teach us the Spanish! Before VBS we made up hundreds of bags of sugar, beans and rice that were given to the families of the children who had come to Bible school over the last month. Rosita felt that giving them some food would encourage them to bring their children who otherwise would be kept at home to do chores. We again have witnessed Rosita’s amazing faith and love for these special children as she continues to trust God’s plan. There are many needs for projects around the property to accommodate the children’s needs and we talked about her goals and what St. Paul’s could help with. An immediate need was for tires for her vehicle (a small pick up truck) and we were able to have new tires placed on the truck today! Not exactly Mr. Tire but it got done eventually! She was so appreciative as this is her only vehicle in Coban and she needs to travel at least 6 hours through the mountains to Guatemala City where she needs to take her son Pablo and sometimes the other children for medical care. Thank you St. Paul’s for your support of our mission team for supporting this important ministry in Guatemala to grow God’s kingdom. God bless and keep you all in His care as we all work for Him.